I learned to knit at four, embroider and crochet at five and carved my first doll from wood at six. I discovered my Nana's skill with all forms of needlework at seven and became particularly fascinated with my great-grandmother's quilts. I persistently showed up at her doorstep asking for instruction until she relented and taught me the traditional New England style piecework and applique that she used. I discovered Hawaiian quilting at age eleven when my mother bought me a book of American Needlework that had a few pages on it in the quilting chapter. But it wasn't until I moved to Hawaii 25 years later that my idea of myself as a fiber artist really took hold. Hawaiian quilts, because of the culture and climate of the islands, are more art than functional object, more spiritual than aesthetic. My first Hawaiian quilts were a departure from the traditional Kapa, but then I was more New England than Hawaiian. One of my friends called them Irish Hawaiian. The Hawaii State Foundation on Culture and the Arts bought the first, and then the second of the quilts that I made there for their Art In Public Spaces program. The second quilt, Lau Puka Puka, hangs in the governor's office in Honolulu. In May 2001 an article on my quilts appeared in Art & Antiques under Studio Session and in May of 2002 I had a one woman show at the Scott Potter Gallery in Portland Maine that continued through that summer. I did an invitational article for American Quilter Ultimate Projects which appeared in 2004. 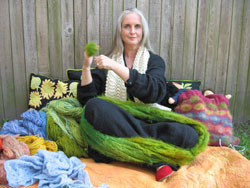 But in 2004 a return bout with cancer took me away from my large projects and sent me back to my knitting and dollmaking, a soothing return to the pastimes of my childhood. I have since finished two large quilt pieces (Moonlight and La Bella Familia) but have retained at least half of my focus for smaller projects and teaching. I have also added spinning and weaving to my repetoire since I began working for Portfiber two years ago. You can read all about my various projects and fascinations by browsing through my articles here on Threads of Meaning or on www.marthamarques.com.